Nope. But it opens a lot of possibilities. You can buy a OnePlus 6 that has 8GB of RAM on board. That’s 4GB more than most other high-end Android phones (and Chromebooks and cheap Windows Laptops) have and about 6GB more than the absolute bare minimum you can get away with. We’ll answer the question right here in the first paragraph: no, you do not need 8GB of RAM in a phone. But it does mean some really cool stuff could happen. We all know that more RAM means more apps can be kept running at the same time (sort of at the same time, anyways) but that’s just one thing your phone does with the RAM inside of it. In fact, a portion of that RAM gets used before Android even starts running. The kernel-space: Your Android phone runs on top of the Linux kernel. The kernel is stored in a special type of compressed file that’s extracted directly into RAM during the device power-on sequence. This reserved memory holds the kernel, drivers and kernel modules that control the hardware and room to cache data in and out of the kernel. A RAMdisk for virtual files: There are some folders and files in the system tree that aren’t “real.” They are pseudofiles written at boot and hold things like battery levels and CPU speed data. With Android, the whole /proc directory is one of these psuedofile systems. RAM is reserved so they have a place to live. Network radios: Data about your IMEI and radio settings are stored in NVRAM (Non-Volatile memory that’s not erased when you power off your phone), but get transferred to RAM along with the software needed to support the modem when you first turn on your phone. Space is reserved to keep this all in memory. The GPU: The graphics adapter in your phone needs memory to operate. That’s called VRAM, and our phones use integrated GPUs that have no stand-alone VRAM. System RAM is reserved for this. Available RAM: This is what’s left over, minus any extra reserved for file-system cache and minfree settings. This is what the apps you run can use. Having 8GB of RAM means any or all of these different ways RAM is used can use a lot more of it if it needs to. Or if a person writing the operating system wants to try something new and different. What can you do with extra RAM? I’ll start by saying it’s not entirely clear what exactly OnePlus is doing with the extra RAM or what plans it has for the future. On the face of it you have to expect it won’t do too much more on a system level considering the base OnePlus 6 model still comes with 6GB of RAM and uses the same software. But there is one thing that OnePlus (or any custom ROM developers) can do that would be a great way to use an extra 2GB of RAM: store the entire system home launcher in it. 8GB of RAM means more could be set aside for the user interface or a game mode. Think back to the HTC M7 if you’ve been around Android that long. It was the first phone that used Android and was super-responsive when you were zipping around the OS. It was because a good portion of the system RAM was “reserved” for HTC Sense and wouldn’t be freed when another app asked for more memory. In the M7’s case, that meant it couldn’t hold as many apps open as other phones. Most companies making Android phones do something similar now and set things up so that parts of the launcher are never removed from RAM, and Android feels much better to use because of it. 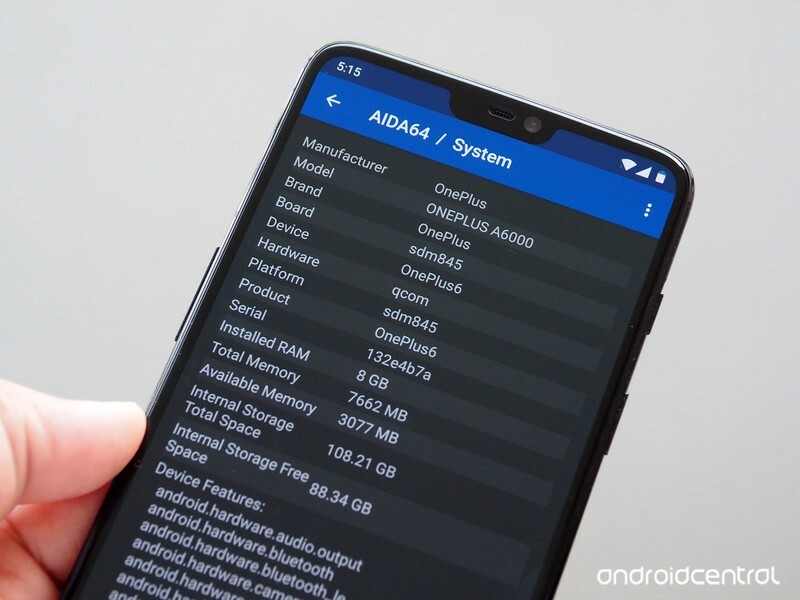 With 4GB of RAM, getting a balance that offers good performance without upsetting users who want to keep apps open in the background can be tough. With 8GB of RAM, the whole user interface can not only be kept in RAM, but done with a real reserved block outside of the system memory parameters. Writing a device driver that enables DMA (Direct Memory Access) for the user interface means RAM can be set aside for use by only the user interface. The operating system still controls the i/o, but no other application can overwrite any part of it so everything needed for “instant” scrolling and swiping is held in RAM where it’s fast and ready at all times. OnePlus may not have anything planned for the extra RAM, but I’m sure developers at XDA will. This is a little different than the memmap kernel parameter that reserves space outside the operating system for the radios and VRAM, but it lets the OS manage the RAM so data can move in and out and a buffer can be written when you shut the phone down to prevent data loss. It’s a more robust solution than using the standard Linux LMK (Low Memory Killer) system to keep important processes running. The end result is a user interface that’s fluid and responsive all the time, without affecting the way other apps run or stay alive in the background. And that’s just one example I thought of without digging too deep into it all. Perhaps imagine a tweaked minfree settings so we can leave every app we love open in the background all of the time. The OnePlus 6 can have 8GB of RAM to do crazy stuff with the OS for better performance, but it likely has it simply because it can. RAM isn’t expensive. At least not component RAM used on a phone mainboard. Spending a few dollars more per unit (which can be a lot if you sell millions of units) to give the OnePlus 6 something the Galaxy S9 or iPhone doesn’t have is a real selling point in parts of Asia and for a lot of enthusiasts. Plenty of people are obsessed about the specs of a phone because they understand how they could be used, or simply because more is always better. Double the RAM of other flagship phones makes the OnePlus 6 more futureproof. I’m sure someone at OnePlus did the math and figured that through a combination of all these factors, it was beneficial to sell an 8GB RAM model. We’ll end this the same way we started: by saying no, you don’t need 8GB of RAM in a phone. But it doesn’t hurt anything, and the creative freedom it gives to Android developers, both at OnePlus and third-party devs, could very mean some cool things will be coming.